Ivon J. Johnson is currently employed at ESU 4 as a school nurse. She received her Licensed Practical Nurse Diploma from Southeast Community College. Ivon grew up in Ecuador and is fluent in Spanish. Ivon is a certified instructor for the American Red Cross in CPR, First Aid, and AED. 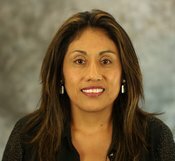 After leaving her home country of Ecuador in 1995, Ivon came to Johnson, Nebraska. She has a husband and three daughters and loves spending time with them. Ivon enjoys reading, jogging and traveling whenever possible.